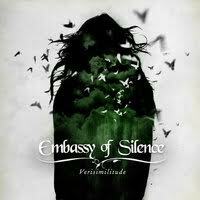 EMBASSY OF SILENCE, a Progressive Rock and Metal band from Finland… Fronted by Ines Lukkanen. The band incorporate very catchy musicianship and know how to create an enjoyable project. EMBASSY OF SILENCE have been around since 2007; releasing Demos, an EP and a couple full-length albums “Euphorialight” and “Antler Velvet”, so the band are already in their prime. For me…starting with “Shame, Spin & Click” I felt at first this wasn't for me but as soon as I started listening – I already began to enjoy my self. It's nothing insanely crushing or deadly; but an enjoyable Rock/Metal fused winner. “Thimble” has a slowed down but atmospheric touch, almost in a Gothic-like – worldly view but combined with a positive vibe that Progressive Rock/Metal can portend. “Absurdoscope” has a similar vibe. Very catchy vocal talent an outright impressive musicianship. That said, if you're here for a typically deadly brute fest; this might not be for you. But that's not to say there's no reason for you not to try it out at least once. The fusion of their Rock/Metal knowledge really works well. I've listened to a few Progressive bands and they just didn't really do it for me. But I like what EMBASSY OF SILENCE have done. At least it's in English and doesn't sound boring. Acoustic guitars to keyboard, these are elements really stand out. The band create positive vibes and are full of many surprises which got definitely took me by surprise. “Flamer” has some really enjoyable lyrics and vocals. “Moths” blasted some fancy riffs; Tero Kalliomäki and Jarno Suodenjoki know how to create some rich and epic riffs; Samu Lahtinen on bass adds the power as well as Make Lievonen on his Drums - making “Verisimilitude” one of my best “Progressive” albums to date. “Of Matters Dark And Grey” is where things get more technical and awesome. I sensed a couple Black Metal-like atmospheric influences here; which really added to the blasting power to get the listener more excited. And that's not enough, they even add violins and deeper bass cords in effect. Ending the album where these 2 tracks are the longest. “Dear Mr. Steele” has a similar arrangement of the epic chillness and added powerful atmosphere. This is truly a great album. “Verisimilitude” is a fascinating album; I was shocked by surprise thinking this would be another Prog album that would feel boring like my previous Progressive attempts of trying to listen to say MASTODON, for example. But I was dead wrong. EMBASSY OF SILENCE have really outdone themselves with this one and are far from boring – very enjoyable stuff. An almost perfect venture. I am glad to give this a higher rank.